So much goes into planning a successful party. Let the experts at Southern Elegance help with the most important details of your event. Start with a savory selection of tray-passed appetizers. Next, serve a sumptuous feast buffet style or plated and served to each guest by a professionally trained server. Finally, indulge your guests with an inviting display of homemade desserts and sweet treats that will make everyone smile. Southern Elegance has menu options for any time of day -- breakfast, brunch, lunch, and dinner. Start your day right with a classic continental breakfast served with fresh juices, seasonal fruit, baked pastries, and hot brewed coffee. Include something more substantial like warm breakfast sandwiches or create-your-own omelet bar. Lunch is a great way to gather family, friends, or a business team. Southern Elegance has the ultimate sandwich and healthy salad catering selections to satisfy the heartiest appetite. Evening dinner parties offer a chance to slow the pace, relax and enjoy a good meal and conversation. Let Southern Elegance create a personalized dinner party menu that perfectly suits your style and taste. No matter what time of day or type of menu you need, impress your guests with incredible cuisine, inspired design and impeccable service from Southern Elegance. We are also sensitive to special requests for those with allergies or restricted diets. So go ahead and ask us about the options for gluten-free, kosher style, vegetarian, or vegan menus. Our full service catering staff includes a team of professionally trained servers. They arrive at events well-groomed and in clean, pressed uniforms. Southern Elegance’s servers help create a comfortable dining experience for your guests ensuring that each course is served promptly, beverage glasses are kept filled, and each round of catering plates are removed as needed. Our full service catering team of chefs and servers are trained to cater to your every need including: carving stations, bountiful buffets, catering platters, tray-passed appetizers, bartending, and more. Southern Elegance’s bartending services offer a premium selection of domestic and imported wines, beers, and spirits. So, we are able to provide everything you need for a fully stocked bar — juices, mixers, and special ingredients for signature cocktails. Southern Elegance can provide gourmet coffees, teas, sodas, and designer waters which are perfect complements to our delicious cuisine. Your wedding day is one of the most special days of your life. You want every detail to be just right and so do we. 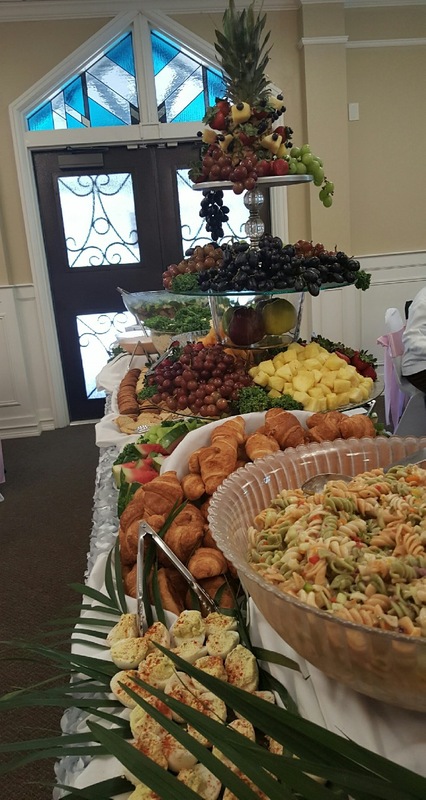 Good food is the foundation for every successful event and Southern Elegance wedding catering team knows it. Our culinary experts will design a custom wedding menu with delicious cuisine perfectly suited to the style and taste of your event. Sign up here for a catering consultation to get started!